For me, Autumn and Winter is all about the bold lip. In Summer i’m all about pastel, light shades. That changes completely in the colder months. If you see me in Winter, you will find me most likely wearing red or berry shades. 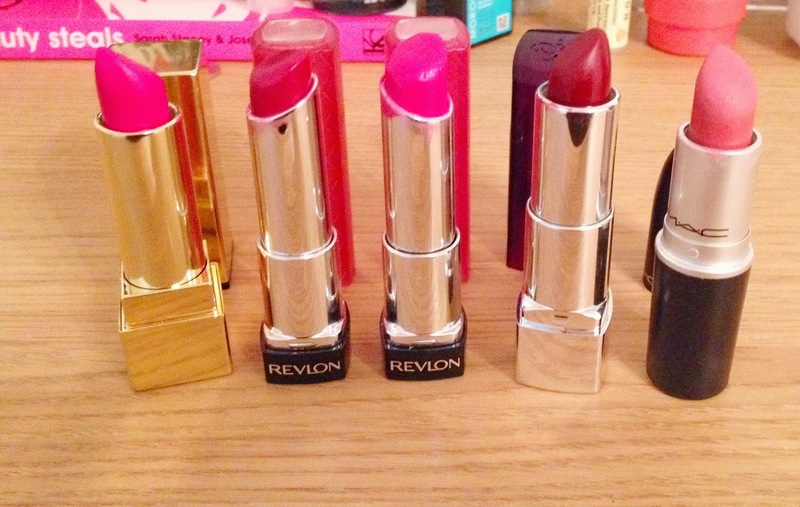 I thought i’d give you guys a rundown of my favourite lipsticks to wear in Winter. In no particular order, because I can’t decide and it wouldn’t be fair to the other lipsticks..
Aside from the gorgeous packaging, I love the colour and formula of this lipstick. The perfect pink/berry colour. It glides onto the lips, leaving them hydrated and looking so kissable, as Aaron says, if that isn’t a sign of a good lipstick then what is?! I have a full review here. The Lip Butters are a favourite lip product for me! The pigmentation is incredible, the formula is incredible and the last power is just.. something else. Raspberry Pie is exactly what it says on the..tube..a lovely raspberry shade. I told you that the Lip Butters were one of my favourite lip products 😉 Lollipop is a bright fuschia pink with a purple shimmer and blue undertones. What I love about the Lip Butters is that they apply like a balm, but last look like a lipstick. The lasting power of these isn’t great, lasting only about 3-4 hours before reapplying, but I think I can let that go, as the colour pay off and formula is so good. I think this is my favourite lipstick at the moment! A gorgeous deep berry/purple lipstick, very vampy-esque. I love to wear this with minimum makeup and lashings of mascara. I’ll definitely be wearing this throughout the Christmas period. Christmas parties especially. I hope you guys enjoyed seeing my ‘Top 5 Lipsticks | Winter Edition’. I’d love to know your favourite Winter lipsticks! Next PostMy Top 5 Red Lipsticks | Beauty Essentials. A Letter To My Baby’s Daddy. Love these lipsticks! The YSL one looks gorgeous!